For example, spaced this way, it says "And [he] hated a stool". Did he hate that stool enough to tattoo it on his wrist? Of course, the tattoo might actually refer to the guy's girlfriend, a chatty girl apparently, if she is the explanation behind a Hebrew tattoo that says "And [she] hated silence". Have any idea what this victim originally meant? Tell me! looks a bit like "hated jews" to me if add a yod and its not full writing. If read left to right, possibly the name Manda.. something? I'm going based on the fact the second to last letter looks more like a misplaced nun sofit than a vav, since the vav looks like it's a different shape. And if that's the case, not too much of a stretch to say they accidentally used a ם instead of a מ. Well, 12 points, typo, for finding this well-stirred alphabet-soup. Your two guesses are the most coherent options. Overall it reminds me of Weird Al's subtitle in the parody-video of Nirvanna's "School Spirit". "Untranscribable Utterance".. something like that. My take: (left to right): "Mem and Dalet? Ha, they got married! No hint on this one what the victim claims it means, huh? Nope, not a clue. 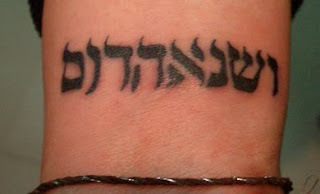 This is another unsolved mystery case in the Bad Hebrew Tattoo files. Maybe I should add a tag for mystery. You're taking the word דום too literally. In that context the word can be refferd as in a meaning of somthing to stop, to die out. "ושינאה דום" as "and hatred will stand still". He just forgot the nikud HIRIK bellow ש but it still acceptable. Maybe he hates dossim :P Final M and S kinda look alike. if you read it from left to right, it seems a bit like "MODE ANI", a name of a morning prayer saying "I'm thankful". The 2 letters at the end are unnecessary, though. Can't it be "VeSin'a Dom" - as in: silence be to hatred? Hello everybody. I'd like you to help me. How would you translate this phrase into Hebrew? "Enjoy the silence". Perhaps it is supposed to be resh and samekh rather that dalet and mem sofit - something along the lines of "hatred and destruction" or "hatred destroys"?